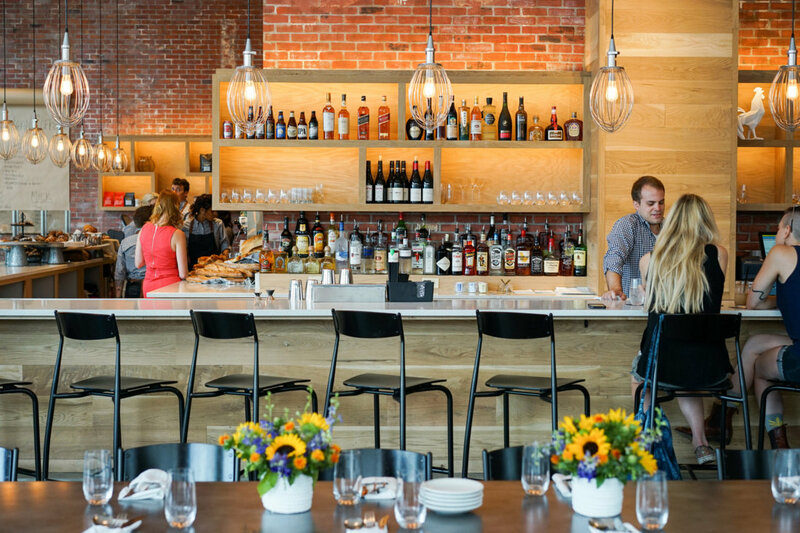 South Market District is a blossoming neighborhood full of things to see, do, and eat. A once-sleepy corner of the neighborhood that was for years mostly surface parking lots used during sporting events and Mardi Gras is now a major destination in the Crescent City: meet South Market District. 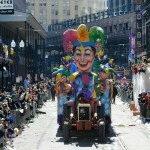 The South Market District, affectionately coined “SOMA,” incorporates new construction of live/work/play buildings with luxury loft apartments and the best in New Orleans retail and dining all in one place, just steps from the Julia Street art scene, a few blocks from St. Charles Avenue and the Warehouse District. Read all about SOMA and its local business and restaurants, one of which is offering an exclusive Happy Tuesday deal: Print this Willa Jean coupon for half off dessert with the purchase of an entree on Tuesdays from 5 p.m. until close. The neighborhood surrounding SOMA is also experiencing its own renaissance, with a soon-to-open Ace Hotel, the recently restored Civic Theater, dining and bars on nearby Poydras Street, the spiffy downtown Rouse’s grocery on Baronne, and retail such as Fraques men’s store, Buff Beauty Bar, Hiro Coffee, and a soon-to-be-renovated circus theatre that was once home to the Scottish Rite Temple. Most of the current businesses are situated in the recently built red brick Paramount building on Girod Street, between Rampart and O’Keefe streets. Nearing completion is the charcoal brick Beacon, which will help formalize the vision of this unique neighborhood. Scroll through the photos (and their helpful captions) to get a feel for SOMA. 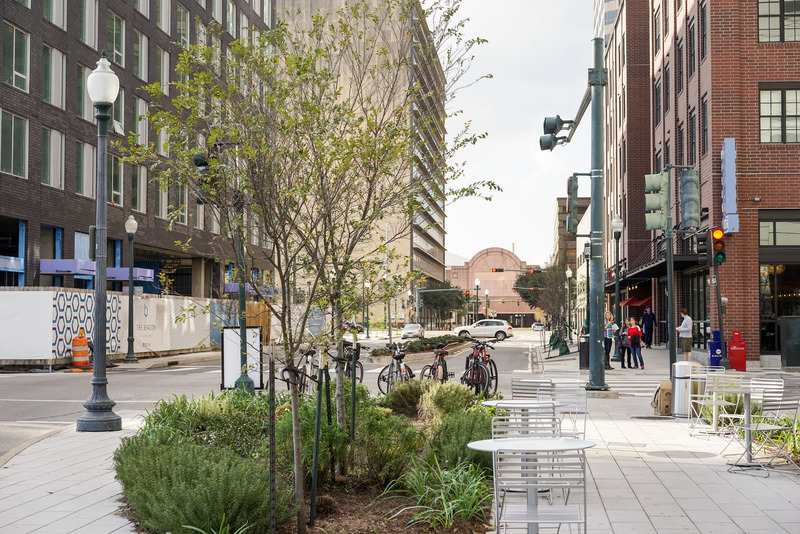 The parklet at the intersection of Girod and Rampart is the hub of the newly opened South Market District. At left in the background is the soon-to-be-completed Beacon, with retail and dining planned, and the red brick building of the Paramount, which is nearly fully fleshed out, buzzing with dining and shopping experiences that are uniquely New Orleans. 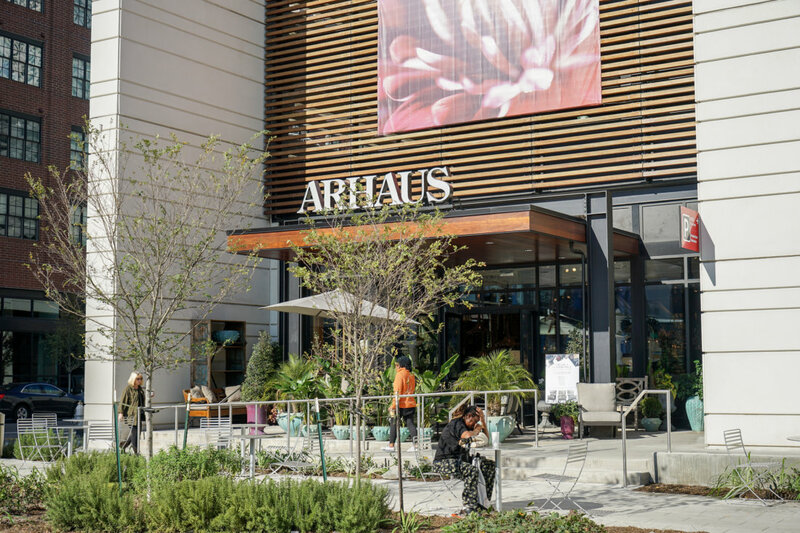 The Park building is anchored by Arhaus, the national furniture and houseware chain. Also in the building is a CVS pharmacy, an ample public parking garage, Hattie Sparks boutique, and the location of Enterprise Car Share — an hourly car rental service where you can pick-up and drop-off cars for short trips. All this shopping has me hungry! Next door to the Park building in the Paramount on Girod is Magasin Kitchen, the offshoot of Magasin Cafe on Magazine Street, a popular contemporary Vietnamese restaurant. 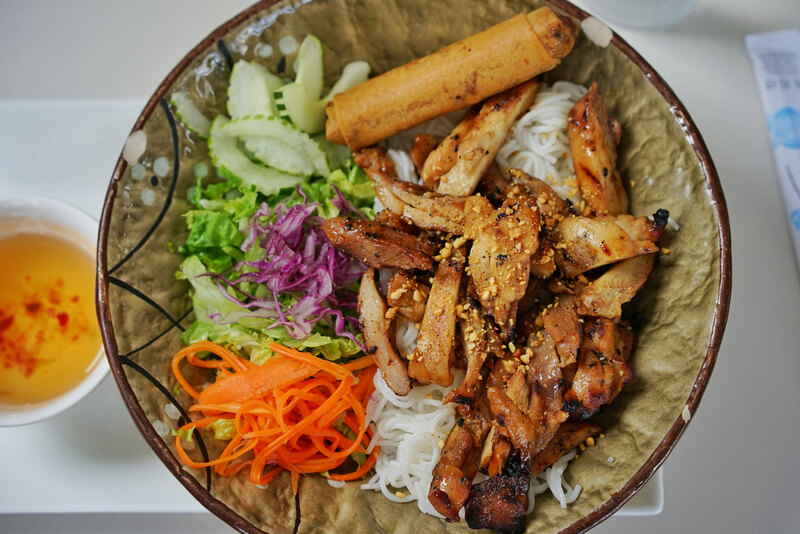 A very satisfying bowl of Bun – vermicelli noodle salad with pork summer rolls, chargrilled pork and all the pickled accompaniments. 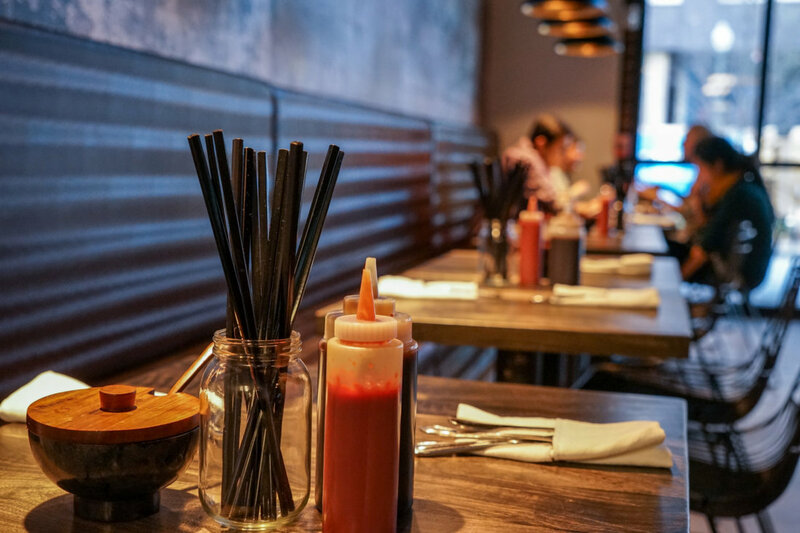 The Vietnamese have contributed so much to the population, culture, and fabric of New Orleans so much so that Vietnamese cuisine feels very much a part of our world-influenced ethos here. That New Orleans has one of the largest populations of Vietnamese immigrants in the world probably doesn’t come as much of a shock. We’re seeing new generations of Vietnamese-Americans open restaurants in the years since their parents and grandparents started coming over to New Orleans in the 1970s. 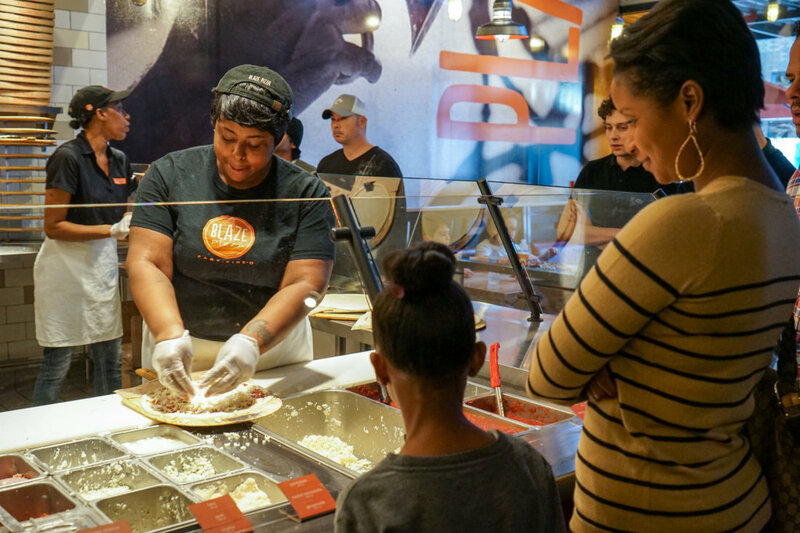 Crispy, thin-crust pies with creative toppings are the draw at Blaze Pizza, another eatery located adjacent to Magasin, Willa Jean, and Company Burger 2. 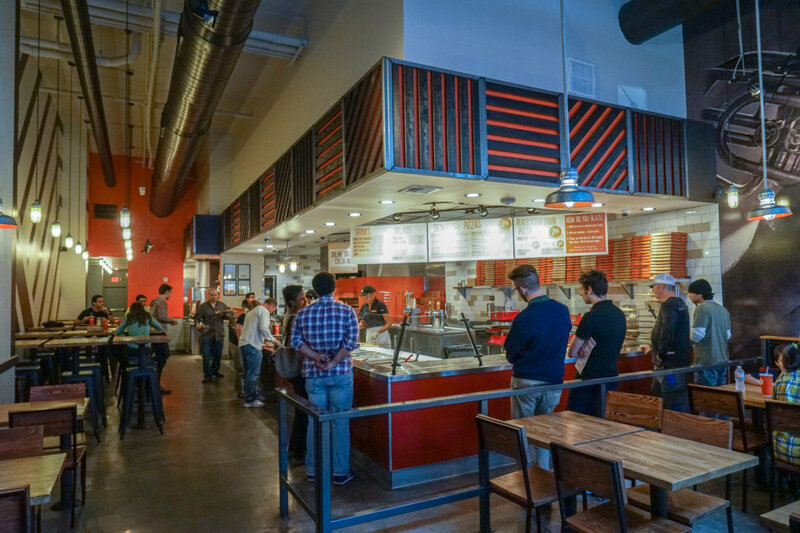 You truly have options for any type of cuisine you crave in this jam-packed block — and at Blaze, you have options for any type of pizza you desire. The build-your-own option is great for picky eaters; their signature pizzas are ideal for when you just need someone else to tell you what to order. Cheese, please. Lots of it. Next door to Magasin Kitchen is Willa Jean…you can’t miss its retro neon blade sign hugging the corner and its walls of windows full of diners eagerly eating desserts and savory foods from chefs Kelly Fields and Lisa White, both of the Besh Restaurant Group. 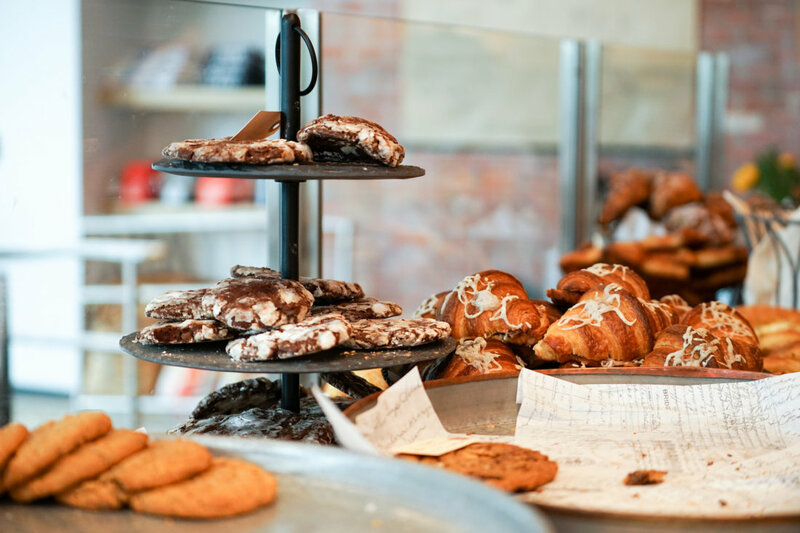 Willa Jean is the spot for downtown breakfast or brunch, with an abundance of pastry and coffee. But more than delicious carbs, Willa Jean shines on the savory foods too…toasts and spreads, fried chicken on a biscuit, and a delicious and hearty, Southern-inspired lunch and dinner menu that somehow manages to hold its own against the jaw-dropping desserts. 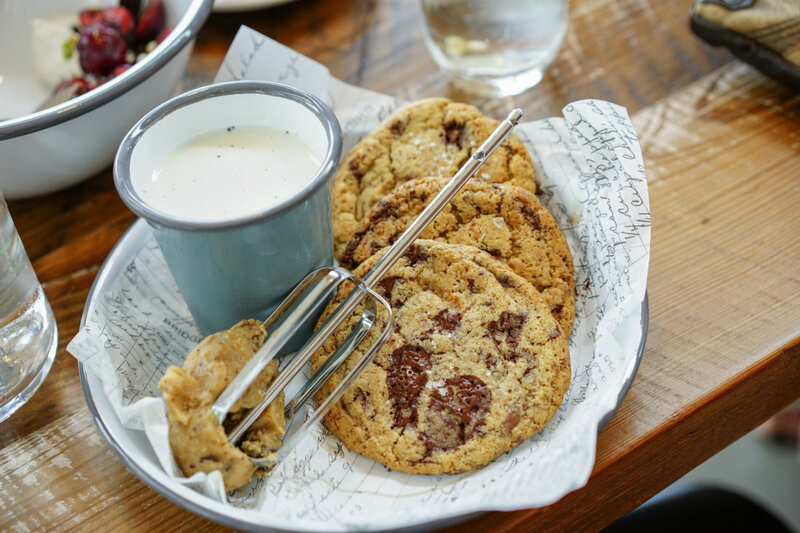 The dessert that has everyone talking about Willa Jean, and yes, it’s okay to lick the beater: Cookies and Milk — ooey-gooey, barely set, and still-warm chocolate chip cookies, cookie dough batter, and vanilla-infused milk. After all this eating (okay, there’s still more food to come in this post. We’re in New Orleans, after all…) it might be time for a workout. 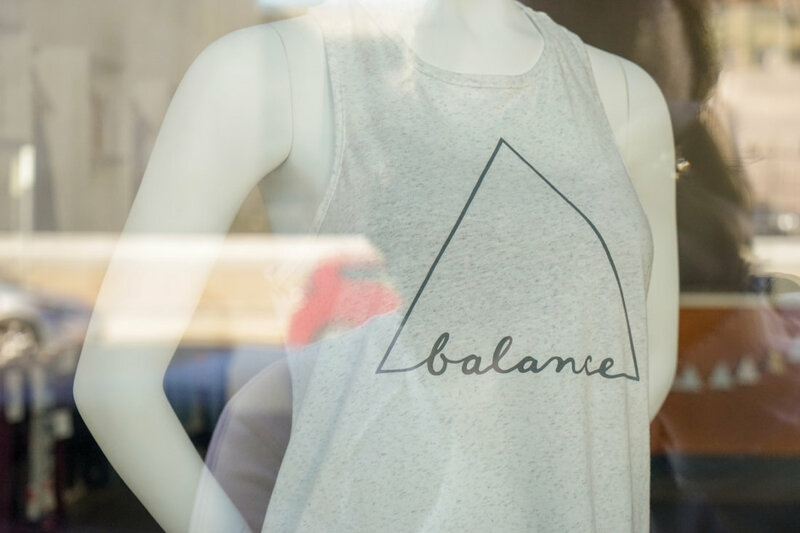 Barre3 is a fitness studio that combines yoga, Pilates, and ballet barre into a guided workout class. Drop-ins are welcome with single class and 3-class options available. 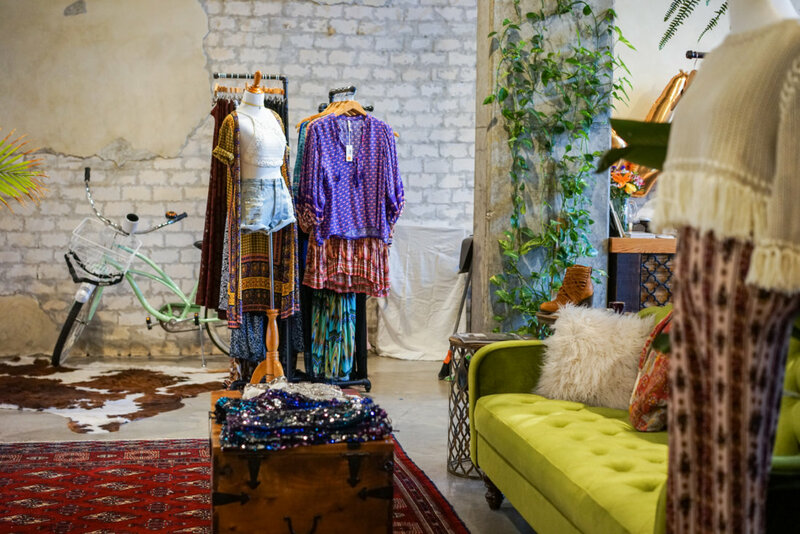 Stonefree Boutique, next door to Barre3 on the O’Keefe Avenue side of the Paramount building is a new, upscale women’s boutique that focuses on the latest in bohemian casual chic clothing and jewelry. You’ll definitely find the perfect outfit for shopping and sightseeing in style or for a music festival. 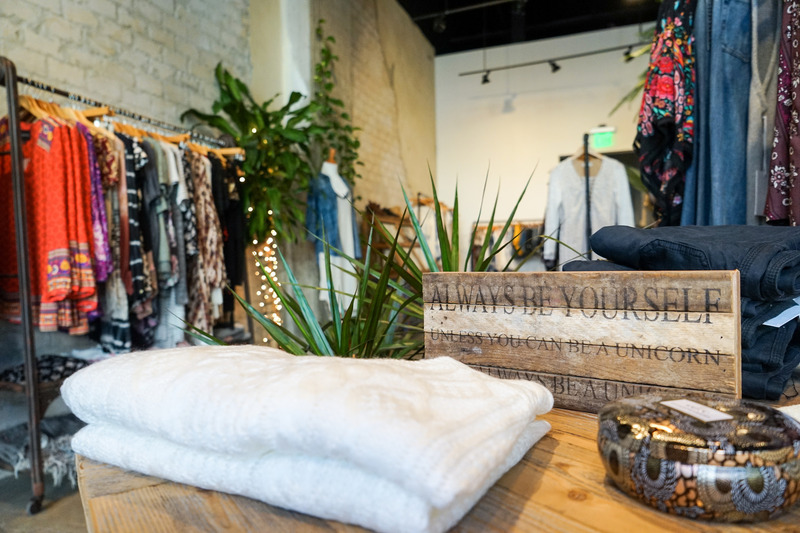 Owner Meghan Koch has a decisive eye and excellent style as a former wholesale fashion rep. The interior of Stonefree is comfortable place to browse and shop, and it’s exciting to see so many businesses, both established elsewhere in New Orleans (like Magasin Kitchen and Company Burger) and restaurant groups like the Besh Group with Willa Jean as well as new businesses like Stonefree take a chance on a completely new development of this scale and commit to reinvigorating a part of downtown New Orleans that hasn’t seen the kind of growth that other parts have had over the past few years. 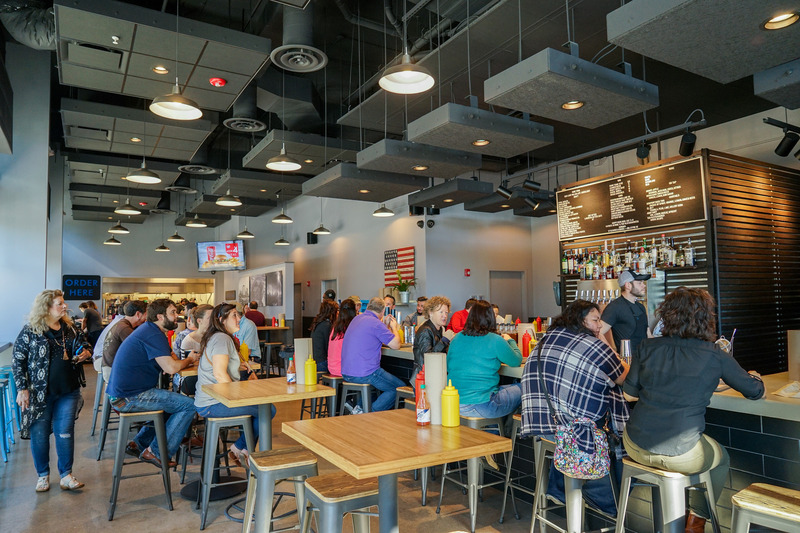 The inside of the downtown Company Burger is similar to its uptown counterpart on Freret Street, except this one is a little bigger — both in the kitchen, number of seats, and now with a full-service bar. It’s open all day, seven days a week for lunch and dinner and is a popular spot to tailgate when there’s a Saints game in the nearby Superdome. 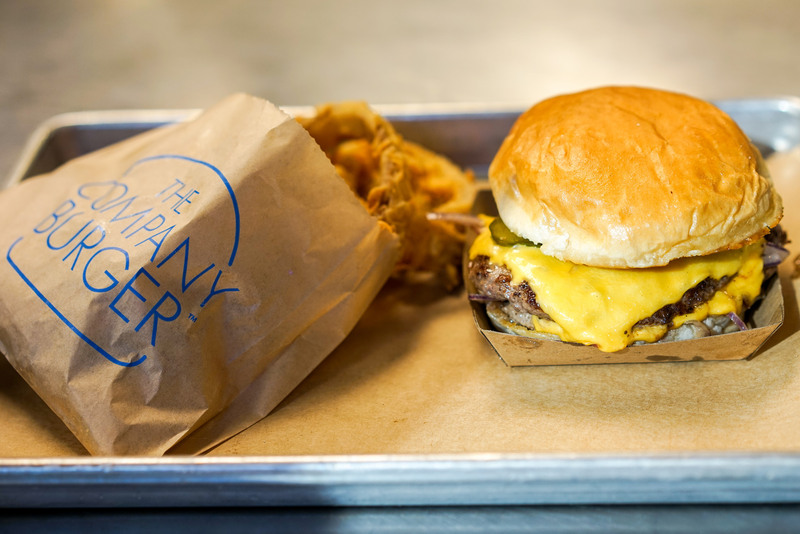 Company Burger uses a premium, all-natural beef for their patties, their own house-made toasted buns, and you won’t find wilted (or any) lettuce or out-of-season hard tomatoes as garnishes on their griddled hamburgers. Just a classic, diner-style hamburger made very well! May I suggest adding a fried, runny egg to your burger (I usually go for the single patty cheeseburger or the classic “Company Burger” double patty, which comes with cheese and grilled onions). Don’t forget the tater tots or thick-cut onion rings. And a milkshake to wash it all down! 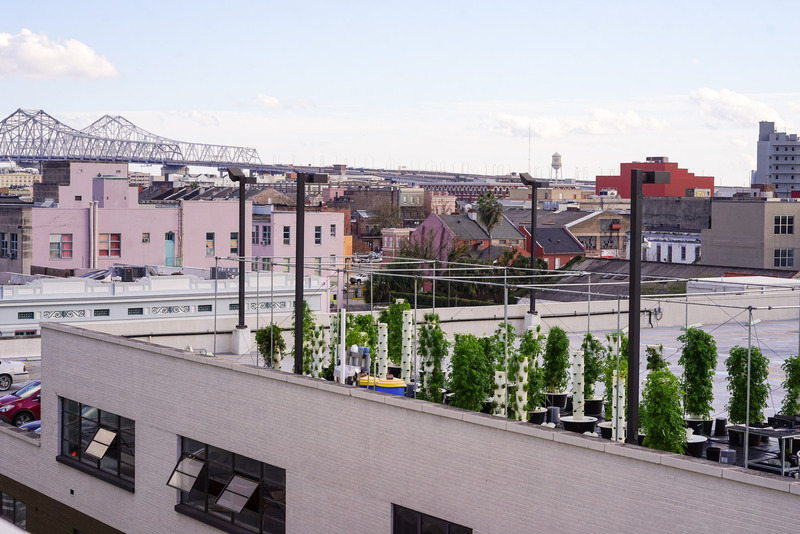 On the rooftop above the parking garage at the Rouse’s supermarket, they have their very own hydroponic herb garden, which provides leafy herbs for sale in the market below. 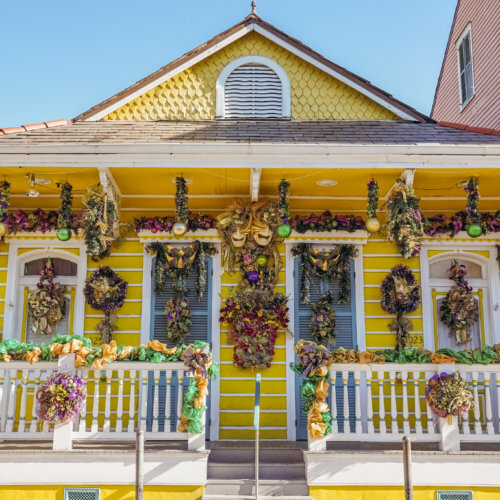 Rouse’s has a great prepared food selection and a large variety of items for a smaller-footprint supermarket, including lots of local items you might want to pick up while you’re visiting New Orleans. If you’re coming for Mardi Gras or a Saints game day, it’s the perfect spot to stop in and grab necessities for the party! 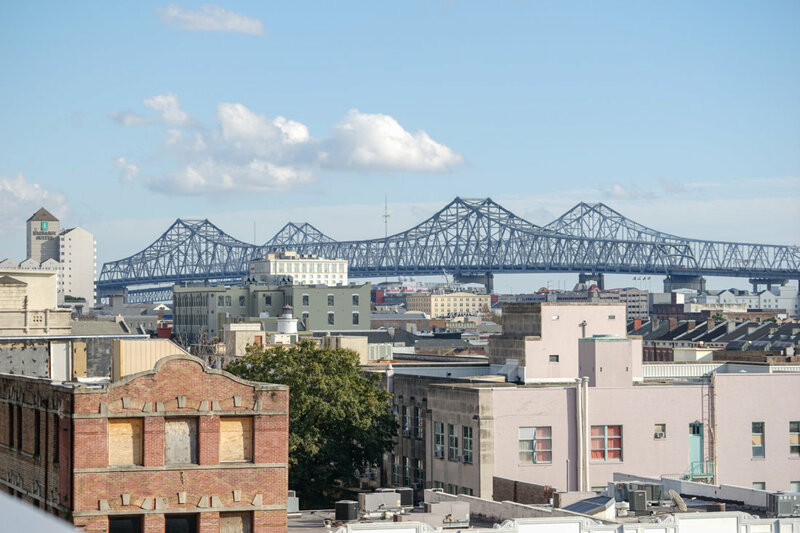 From the roof of the Park building or the Rouse’s parking garage, you can get a good view of the Greater New Orleans and Crescent City Connection bridges and the downtown skyline.